Socialise over Asian style Hotpot - nothing like the English dish of the same name! When my Malaysian friend May invited me to share a hotpot with her, I immediately had visions of the stodgy Lancashire dish beloved by Coronation Street's Betty. Let me tell you now, the meal she had in mind is very different to that! In a nutshell, Asian hotpot (also known as Huo Guo or steamboat) works a bit like like a fondue. The base is a broth which you add ingredients to, cooking and eating as you go, all adding flavour so you end up with a gorgeous soup you can spoon up, with or without noodles - delicious! It's an ancient dish, thought to be 1000 years old with regional variations in Malaysia, Korea, Thailand, China and Vietnam. It's a lovely communal way of sharing food which is very sociable. May (a London food and travel blogger who writes at EatCookExplore) told me to meet her at the new eponymous restaurant Hot Pot in Wardour Street situated in the lively location of London's famous Chinatown. It's right next to the new Chinese gate opposite the W Hotel. At Hot Pot each table has a built in hotplate so broth temperature can be adjusted - you obviously want it bubbling to cook meat and fish. The hotplate has a child lock so little fingers can't fiddle and the waiters will help if you are unsure about how to operate it or what temperature it should be set at. There's an extensive sauce bar with a variety of tasty sauces with enough spice for those who love it, plus less mouth-burning options for cowards like me. There are also ingredients like chopped garlic and coriander you can help yourself to to flavour your broth or to create your own unique sauce for dipping. I'll confess, I would usually opt for the all you can eat buffets in Chinatown, or one of the Dim Sum restaurants if I was feeling adventurous. I was slightly nervous about eating what would probably be more authentic Asian food, especially since I am not great with spicy stuff. I needn't have worried. 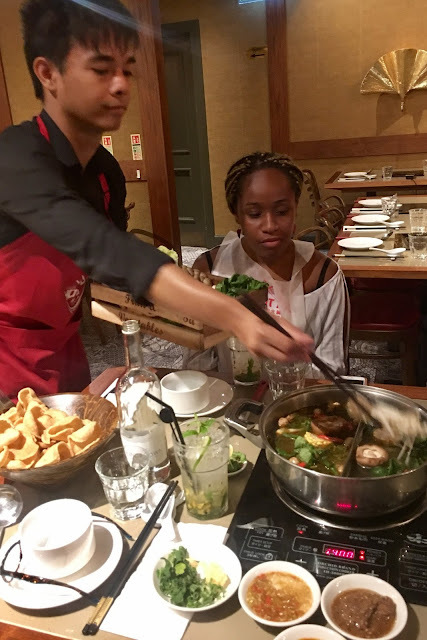 Hot Pot offers the option to have a split broth bowl so while May opted for a Thai-style Tom Yum sauce, a spicy white broth with a hot and sour flavour from lemongrass, prawns, lime, chilli and coriander, I chose the chicken soup with Chinese rice wine, goji berries and ginseng. There were other options including a vegetarian broth. My choice might not have been spicy but it was certainly not bland and by the time we had finished adding and eating ingredients it was a truly tasty broth. I'm jumping ahead of myself though. Our waiter brought our (well, May's) choice of ingredients to cook in the broths. I've never felt so English in all of my life as I couldn't identify many of the veggie ingredients - luckily for people like me, Hot Pot offer a mixed vegetable selection you can throw in and enjoy without necessarily being able to pronounce the names of the assorted mushrooms and vegetables. The staff obviously spotted I was new to the hotpot experience as they offered me a fork along with my ladle, chopsticks and soup spoon! Everyone gets a bib though- saving soup spills on your clothes. I could however identify the gorgeous King Prawns and sea bass we cooked in the broth (placing the delicate fish into the ladles provided so it didn't break up in the hot liquid) and my mouth watered at the sight of the fresh crab our neighbouring table ordered. 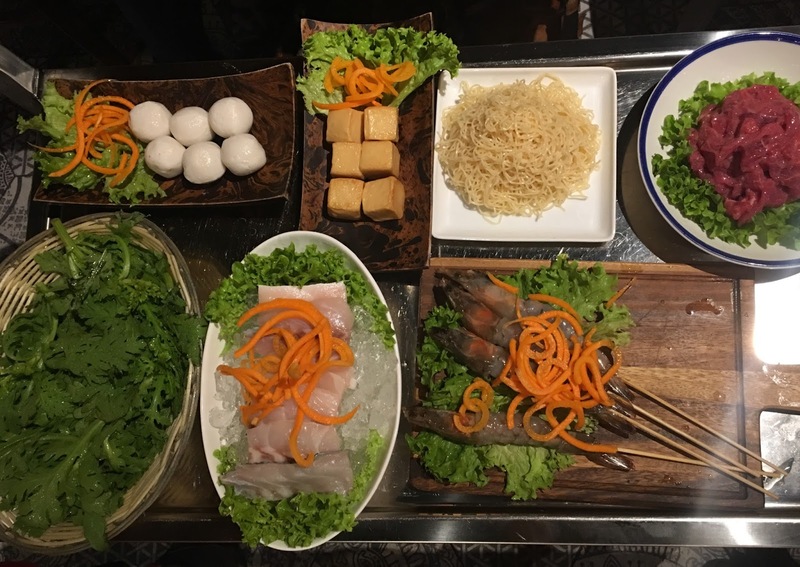 We also had quails eggs, marinated beef and most interestingly to me, seafood tofu and fish balls which I would never have dared order but were very tasty. Our party of four stirred and dipped and ate and chatted and it was such a lovely experience we didn't notice the time fly by. Finally we had eaten all of our ingredients and it was time to add noodles, wait a very short time for them to warm through then slurp up the rest of the soup which by now was extremely flavoursome. It felt like a really healthy meal too - May told me many of the ingredients had health-giving properties and there were very few carbs in the whole meal so I felt full but not bloated. 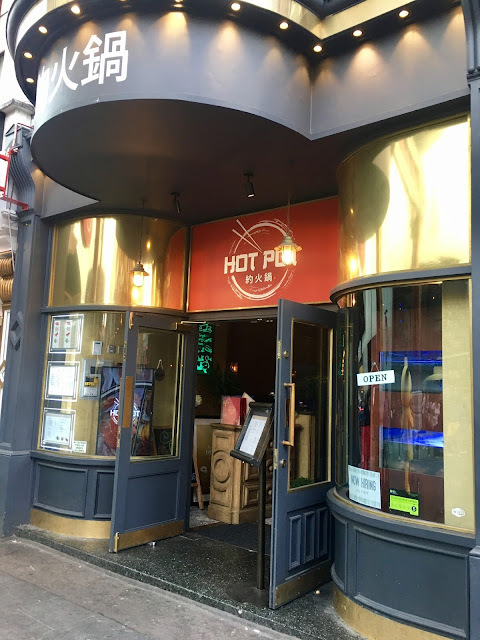 If you fancy a new experience, or want to try Hot Pot's hotpot in the fabulous atmosphere of Chinatown, you can just walk in, or book online. If you have party members who aren't sure about hotpot, they also offer other dishes including Chinese BBQ.